Are you looking for great painter's, with great prices? Look no further! 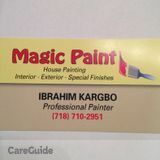 Want to connect with Ibrahim? We even do handyman work! If interested in our services or want to see photos of previous work, please contact by email or phone!